Every sneaker blog you need to have in your daily rotation, ranked from 25 to number 1. Sneaker blogs have become big business over the years. That means a lot of people trying to dip their toes in the money pool for a quick buck, even when they have no business there in the first place. Because of that, over the last few years, the landscape of the sneaker blogosphere has seen some serious changes. Editors and writers that once had very few choices as to where they could make a name for themselves, now have opportunities every direction they look. The same goes for the newcomers to the scene. With so many people trying to make a name for themselves in the "Sneaker Media," there is a lot more to consider in sneaker blogs than just the blog itself. Niche sites have been on the come up, creating dedicated followings for people that aren&apos;t into every type of sneaker and just want to read about a specific element, like style, performance or even athlete. Still, the big-time blogs and magazines can reach massive amounts of sneakerheads on a daily basis. With those things in mind, take a look at The 25 Best Sneaker Blogs Right Now. There are sneaker blogs that act as an aggregation source of images floating around on Instagram and other sites. But then there’s one blog that’s a reliable source for all of the others. US11 is a Japanese site that serves as a news stream of previously unseen sneakers and photos from around the NBA from the night before. If your favorite sneaker blog is posting something, there’s a strong chance it came from US11. Campless may be relatively new to the sneaker blog world but they make up for offering the best quality information on the actual worth of your passion. By focusing on the resell prices of sneakers, Campless has become a must-read for anyone who is serious about the value of their collection. They are essentially responsible for the Kelley Blue Book of sneakers as they recently released, in collaboration with Sole Collector, The Sole Collector Price Guide, the only data-driven handbook for sneaker resale values. Josh Luber has taken the info we all pay attention to and organized the data in ways that make Campless an invaluable part of sneakers. Just ask Cleveland Cavs owner Dan Gilbert who recently invested big bucks in Campless. Germany&apos;s Sneaker-Magazine is clean and has a ton of great on-foot shots but there&apos;s much more to it that makes it even better. With giveaways, events and a print magazine, these guys really capture all aspects of sneakers while having a print mag and recently producing their own absinthe-inspired collab with Kangaroos. Not to mention that the print version of the magazine unveiled the Ronnie Fieg x Diadora this year, too. High quality images and a clean layout make Sneakers Addict one of the best looking sneaker blogs on the web. In addition to news, the #SADP series features on foot imagery that shows just how to wear each and every style. Proof that you don&apos;t need to overcomplicate. As one of the longest running sneaker blogs, EUKicks has been a mainstay since 2006. In recent years, their Sneaker Tracker feature has become one of the best ways to see if and when a sneaker becomes available. And we&apos;re not just talking in the UK, it&apos;s a solid resource no matter where you are in the world. As one of the driving forces in fashion, you can&apos;t overlook Paris. Just ask Kanye, that&apos;s where he set up shop for his Yeezy Season 2 Collection. No sneaker blog represents the trends in French footwear better than Sneakers.fr. What makes the site&apos;s approach unique is its focus on sneaker styles that resonate with the European consumer and have become increasingly popular in the U.S. market. It&apos;s also a site that&apos;s been known, given the early rollout of certain sneakers overseas, to have release information before its American counterparts. It&apos;s not a site that posts all the sneaker news, just the stuff you want to read. Sneaker Bar Detroit has been around for years and what they do best is aggregate news and releases in the most nondiscriminatory way. You may not think that&apos;s a big deal but it means you don&apos;t have to deal with shout outs and discount codes to trash brands. Not to mention, Detroit is on the come up and there could be good things for SBD because of that. Sneaker Watch pulls access to entertainers better than almost anyone, thanks to the site being run by DJ Vlad. He&apos;s been known to conduct some of the most lively video interviews on the Internet, and the series with Mayor earlier this year set the Web on fire, literally, as Mayor showed disregard to a pair of Undefeated x Air Jordan IVs. And if Sneaker Watch&apos;s pageview counters are accurate, they&apos;re doing pretty well. We could do without the gallery for every single post but, hey, you gotta get paid. That&apos;s the way it is. If you&apos;re looking for a community, TSG is where it&apos;s at. Between the Daily Photos series, Ray P&apos;s witty banter, and the amount of conversation that happens in the comments of every post, The Shoe Game has managed to hold on to a part of sneakers that most people think is dead. CK does a good job of covering new release info but adds a handful of things through their YouTube channel, run by founder DJ HES that make it even more valuable. Real vs. Fake comparisons, reviews and coverage of events like the Doernbecher Freestyle event, make Collective Kicks 360 coverage, with an independent approach to content creation the differentiator from a lot of other blogs. NikeLeBron.net focuses on LeBron sneakers and LeBron sneakers only. What&apos;s great about the site is that it covers an unbelievable amount of LeBrons, including stuff you may never see on another site, like NIKEiDs, customs and game by game tracking of what King James wears. The guide to fakes is a solid resource as well. Basically, if you&apos;re a LeBron fan this should be on your radar all day. Kicks on Fire has been going through a transition, and the future looks bright thanks to new additions to the team like Rac and Todd Krevanchi. With the partner app Kixify, their sneaker marketplace, and veteran Juan Martinez at the helm, Kicks On Fire does the most important thing a blog should do, put numbers on the board, which they did recently with exclusive access to Paul Pierce. SLAM is the equivalent of the O.G. at the park. They may not have the stamina to run it back-to-back like they once did, but once in a while they show up everyone else and we&apos;re all reminded where this sneaker media thing started. It&apos;s been awhile since our main man Russ Bengtson was running the show over there, but they scored the exclusive on the unveiling of the Nike LeBron 13 this year, which is a major get for any publication. Nike Blog&apos;s specialty is publishing release info as early as possible. Yeah, sounds the same as every other site, except when you look at the incomparable amount of silhouettes and colorways that actually show up here first. This is what cements their spot on the list. Oscar Castillo and team over at Modern Notoriety have really improved their approach to sneaker blogging by elevating the quality of content in the last year or two. Their focus on creating dope imagery has really taken them to a new level. Quality over quantity isn&apos;t the norm in the sneaker blogosphere but MN is showing how it&apos;s done. For the last 30 years, no sneakers have been more popular than Air Jordans (Sorry, Yeezy). Jordans Daily is all-Jordans, all the time. Which in today&apos;s sneaker world, captures a huge audience. Jordans Daily is also the perfect place for those kids lined up at Supreme to get an education while they wait on line. The site is spearheaded by Yu-Ming Wu, who&apos;s running the sneaker game on many levels right now, and this isn&apos;t even his biggest venture. Nightwing and crew have grown an incredible following over the last few years and if you&apos;re looking for performance reviews, WearTesters is the trusted source. What separates WearTesters from other sneaker blogs is how they approach to the reviews. It&apos;s a group of guys that love to hoop in addition to their love for sneakers. The reviews follow suit, unlike some reviewers who pretend ball is life in order to get free kicks. The Drop Date is a European site that focuses on release dates and providing links to products when they come available. You might not think that&apos;s a big deal but once you realize how simple it is to click through and make a purchase, you realize how many other sites are a waste of time. We&apos;re not gonna name names but plenty of sites will tell you coming soon and throw up a sus pair that very well could be fakes, just for the clicks. Do we really even need to talk about Kicks Deals? We&apos;re all notoriously cheap bastards. We&apos;ve all lowballed someone on eBay before. No matter what type of kicks you&apos;re into, saving money is always a good thing. Let&apos;s not think about the time and effort we had to put in before Kicks Deals came along. The blog that started it all, Hypebeast is the namebrand site for kids who care about sneakers, streetwear, and other elements of their lifestyle. Founded by Kevin Ma, what sets Hypebeast apart from the rest of the sites that try to imitate its taste level. The site integrates multiple topics into one convenient place for its readers to digest information. Not only does Hypebeast have a great aesthetic, but the site also gets many exclusives, set up through longstanding partnerships, on many sneakers. They also recently published an interview with Nike CEO, Mark Parker, followed up by the first reporting on a panel with Michael Jordan and Tinker Hatfield. Going beyond digital content, Hypebeast has a magazine and an online store. It&apos;s a site that takes its brand cachet and it uses it to the fullest capacity. With Yu-Ming Wu at the helm and guys like John Kim on the team, there is nobody better at covering new releases than Sneaker News. 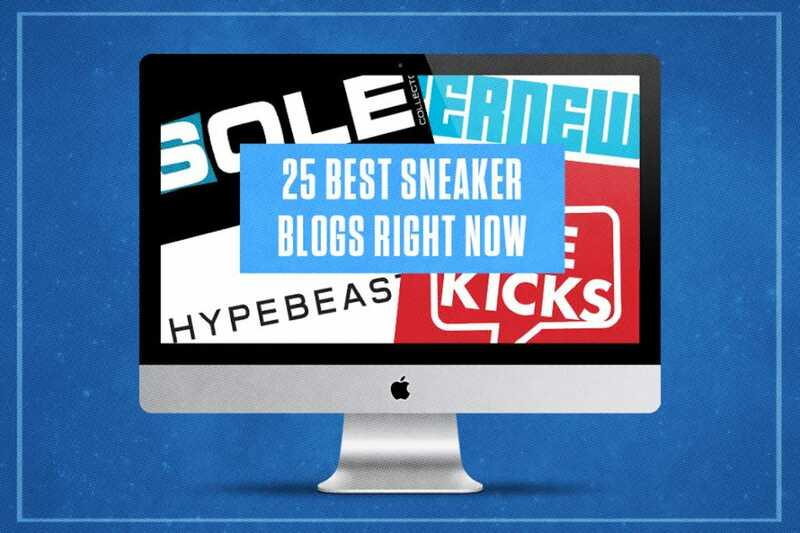 A good majority of blogs on this list wake up and check Sneaker News to see what&apos;s good. On top of the news, they always have high-quality imagery and solid feature stories to go with. Not to mention, Sneaker News, The Magazine, which taken the spot of Sole Collector magazines for those of us still fighting to keep print alive. The days of the print version of Sole Collector may be long gone but Sole Collector is still the most important sneaker site on the web. The news feed on SC differs from many other sites thanks to a more journalistic approach to finding stories about the business side of sneakers to complement the new release info. In addition, the SC Forums help drive the conversation for the entire sneaker community.